Following the BBC Spotlight Session conclusion that the 4th Industrial Revolution is upon us, it seems increasingly important that companies need to keep up with new business models and advancements in automation technologies. 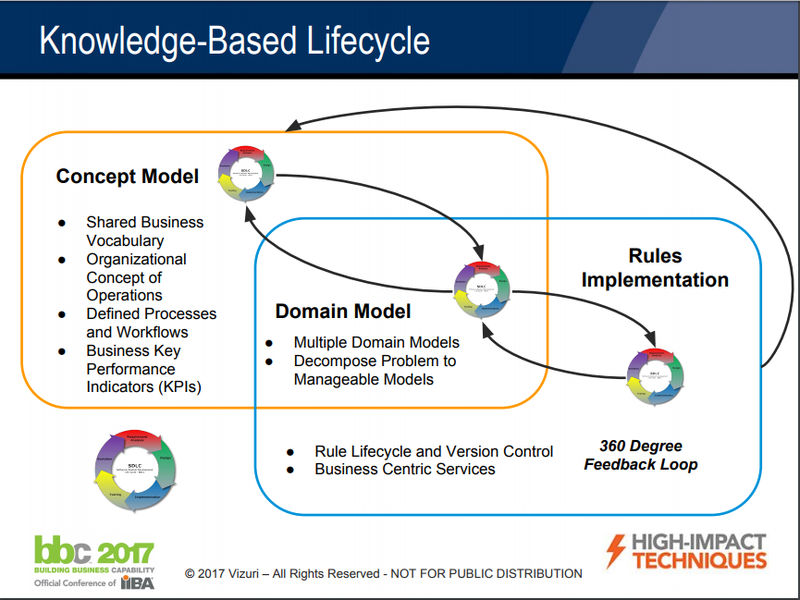 Business professionals need to become aware of the increasing importance of Knowledge Management within an organization and the skills needed to develop strategies for leveraging and aligning with Business Decisions and Rules technologies. 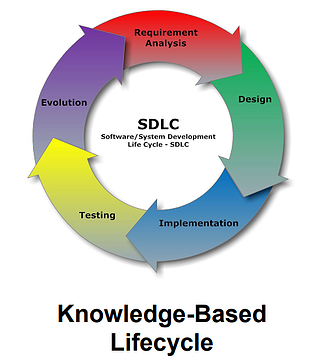 So, how to design for the Knowledge Lifecycle? We tackled this question in our presentation, and I wanted to share additional thoughts. To answer this question, we first have to understand what Knowledge Management means and where it fits in with reference to Digital Transformation. At a high level, Knowledge Management is the process of capturing, distributing, and effectively using knowledge (Koenig, M.E.D., 2012). 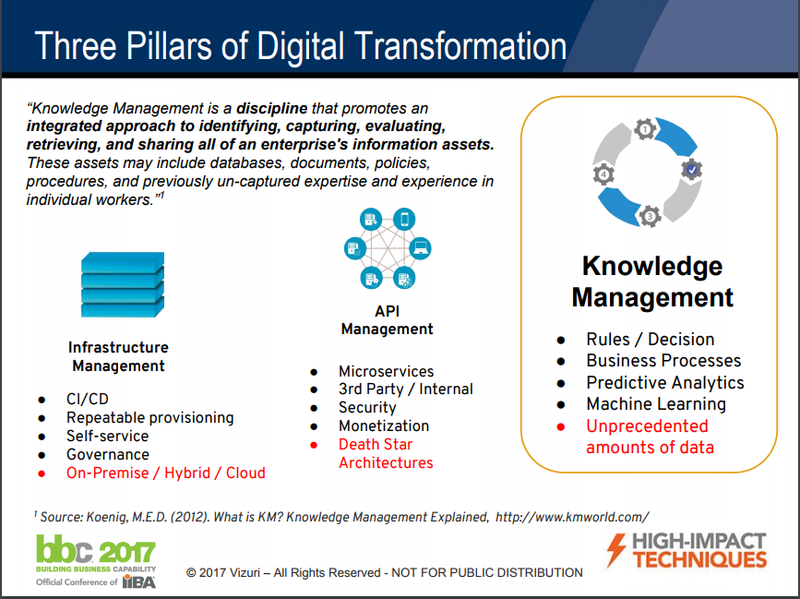 Knowledge Management is a disciplined approach and one of the three pillars of Digital Transformation. 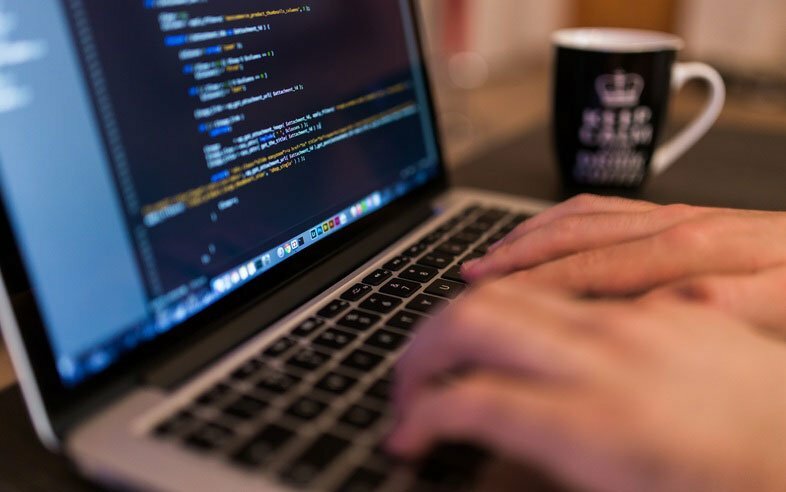 Compared to the other two pillars, Infrastructure Management and API Management, Knowledge Management gets the least attention but is acutely important to enable organizations to deliver value through automation and agility. To capture and increase market share, companies need to act faster when a business opportunity presents itself. The days where the business would task IT to implement and deploy business decisions and processes, only to result in an implementation 6 or 12 months later, is something of the past. To stay ahead, companies need IT solutions within days or weeks. To accomplish this, business professionals need to re-skill themselves and start to utilize technologies that can promote automation and agility. Business and IT professionals also need to bridge the communication gap and find ways to improve communications and knowledge sharing. As part of this effort, business and IT professionals should invest in Knowledge-Based IT (KB-IT), which is the application of a Knowledge-Based System (KBS) to aligning Business and IT to focus on systems that use knowledge-based techniques to support human decision-making, learning and action (Fujita, H., & Lu, J., 2012). Knowledge-Based IT is a solution where knowledge is a first-class citizen and where the boundaries between Business Rules and Process are clearly defined. Business Goals must drive the solution and not Technology restrictions. It also accommodates change quickly without being impeded by Technology limitations. Have you ever been in that situation where IT says it will take a complete redesign or that the software does not support that requirements at all? The process and rule definitions must outlive any software implementation through the decoupling of the Concept Model and rule definitions from the underlying Technology implementation, thereby creating business agility. Just look at the way we fly today. We follow the same process, but instead of a paper ticket we now use smartphones. It is this “process knowledge” that needs to be documented and separated from the underlying IT solution to preserve the company's intellectual property. In a similar vein, when a subject matter expert next resigns or retires at your company, you do not want to find out a few month later that nobody in your company know how the process works or what rules needs to be applied in which situations. In our follow up blog posts in this series, I will focus on how to address these challenges. I will look at how to develop a lexicon that enables Business and IT to communicate effectively as well as how to guide Business and IT organizations in separating rules from processes to support Rules Independence. And I will discuss best practices and an approach for developing a domain model using a canonical vocabulary derived from the Concept Model that will promote visibility, agility and maintainability. These are all tools in line with the Business Agility Manifesto, which highlight the urgency and need for business agility for the future to come. Be on the lookout for our next blog and please come see us next year in San Antonio at BBC Conference 2018. Thanks again to Gladys S.W. Lam and Ronald G. Ross for inviting us to speak at the 2017 BBC Conference. It was a blast! Ben-Johan van der Walt is a Software Architect/Engineer with over 20 years of experience leading successful projects of various sizes and scopes. He is a seasoned professional, with outstanding project planning, execution, mentoring and support skills. He is always ready for a challenge. Has Digital Transformation Jumped the Shark?